Sean Sullivan happens to be one of the biggest dratniks of any Bucs fan Joe has met. 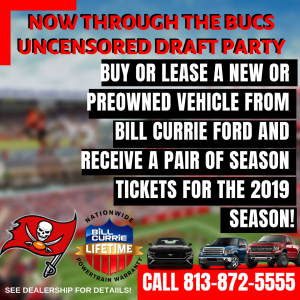 Sullivan is the general manager at Bill Currie Ford, just a couple of punts up the road from the Den of Depression north on Dale Mabry Highway. The draft is not a seasonal thing for Sullivan, it’s a 365-day-a-year passion. When Joe bought his Ford F-150 from Bill Currie Ford this past weekend, Sullivan told Joe he had watched his recordings of February’s NFL combine four times already. So Joe thought it would be cool if Sullivan typed a few stories about draft prospects. Here is his first pass attempt. It is simple: Brian Burns is the best edge rusher in the draft. Period. As a longtime Bucs fan, I reminisce about the great defensive ends this team has drafted over its 42 seasons. Remembering that list takes as long as hitting the unlock button on my brand-new Ford F-250 to think of the only one, Lee Roy Selmon. We spend most of our energy and money recruiting defensive ends drafted by perennial playoff teams and overpaying them to play here. Before a decent season by Jason Pierre-Paul in 2018, every conversation about a Bucs’ pass rusher revolves around Simeon Rice. He was a freakish athlete with incredible bend and flexibility that changed our lives forever when he signed. We now have a chance to reincarnate Simeon Rice 2.0 with Brian Burns from Florida State. He’s a more athletic version of Rice – yes, that’s right! Burns translates seamlessly into a 3-4 outside linebacker with a polished pass rushing repertoire. According to Pro Football Focus statisticians, Burns led all edge rushers in the ACC with 66 total pressures and a pass-rush grade of (90.4). And yes, that’s better than all the hyped Clemson edge rushers. Burns also recorded 51 hurries, 10 hits and 8 sacks. His 19.7 percent pass-rush-win-percentage was fifth in the country. I do not believe stats are everything but they do help solidify the film on a player, especially a player with three polished pass rush moves with the fastest first step in college football. Burns: 6-5 248 pounds, 34-inch arm length and ran a 4.53 40 at the combine. 2016: The Bucs selected Vernon Hargreaves with the 11th pick in the first round. He ran a 4.53. We drafted Ryan Smith 108th overall in the fourth round and he ran a 4.47 40. 2017: The Bucs selected Justin Evans 50th overall, he ran a 4.60. 2018: The Bucs selected M.J Stewart 53rd overall, he ran a 4.54. Also in the second round, 63rd overall, we selected Carlton Davis who ran a 4.53 40. None of these players are close to Burns’ height and weight combination. I believe we can trade down with the Denver Broncos and pick up an additional second-round pick and fourth-round pick and still get our man Burns at No. 10. Instead of showing college highlights which make even a fourth-round pick look good, pay close attention to this clip that shows a 6-5 248-pound man catch a football going out of bounds with one hand. That’s not D.K. Metcalf in the video, that’s our future pass rusher. If he’s that good, just take him at #5 and get your man. But he isn’t. So let’s take a guy at five who can turn this defense around. No more top 5 draft picks. I’m sick of trading down to mediocrity, and I’m sick of swinging and missing on “could have beens”, and I’m sick of losing. Stop the bleeding Bruce Arians! Interesting and fresh perspective. I love the idea of picking up extra picks in this draft. Especially with Bowles and BA leading with A PLAN. I trust them to do what’s best for the Bucs. Also, I agree we have pretty much struck out in free agency period lately AND we haven’t drafted well, nor have we coached well. Side note, this is also a better read than anything ‘Shill’ Joe has scribbled out in weeks. So thank you Joes for bringing us a new and thoughtful perspective. Just don’t get too Ford Pluggy and it will be welcomed. As the only member of this site banging the table for Brian Burns at 5, its nice to have some company. He has the length, athleticism, production, explosiveness, flexibility, coverage ability, a variety of pass rush moves, good hand usage… the guy has it all and nobody is talking about him. Blows my mind. Only knock on Burns was strength concerns and he added almost 20 pounds of muscle and still tested like an elite athlete. Isn’t Montez Sweat bigger and faster? Don’t know that Burns is better than Allen or Bosa, but would be thrilled with a trade down once or twice in the first that landed White, Bush, Taylor or Burns. Whenever I hear someone banging a drum for a FSU or Gator player, I tend to assume that the drummer either attended or is a diehard fan of the respective school. Mr. Sullivan, I have a question: In your case, is my assumption correct? So – a good deal on a truck purchase = guest columnist? Simeon Rice 2.0- eh? That’s one hell of a projection. I’m not saying Burns wouldn’t be a viable selection (if the Bucs trade down into the 12>15 range) but expecting him to live up to the standards set by Rice and Selmon is just a bit optimistic I’d say…..
Ok. I just went to view Brian Burns combine and field workouts. If you haven’t, please do so. HOLY S**T can he move!!!! You talk about fluidity in his hips, his feet, his freakin hands are WAAAY better than our #1 corner right now in Carlton Davis. I have completely overlooked him due to him just appearing too thin on his FSU tape, but he has easily put on 30lbs of muscle and seems to move better with the additional weight. I’ll admit I’m impressed! If we can pull off the above proposed tr down with the Broncos, I’d be ecstatic!!! Must be an FSU fan. He is good but no way he is a better edge rusher than Allen. I wouldnt be upset if they took Burns but hopefully not at 5. Allen should be gone. I’d personally take Sweat over Burns too but they must take an edge rusher. That much is certain. Hope whoever they pick turns out to be the right one. MLB and help for the right side of the OLine are certainly bigger needs…. I’d be ok with this if we trade down. It would be really nice having an additional second rd pick with our needs. Look, I’m a Nole, but this is insane. Burns is a good player who hates contact. Doesn’t like finishing, isn’t nasty and does not have value as a top 10 pick. If we want Burns we should be thinking of adding Oliver, Williams, Jeffrey, or Lawrence to pair with him. @TDTB – Goodness, I’d be so pumped if somehow we could trade down twice in 1st rd and still land one of these top Edge rushers. Burns is good, but anyone that has watched him every saturday over his collegiate career knows that there are major questions with both his motor and consistent effort. He also disappeared in some pretty big games. I wish Burns success, and he’s got great intangibles, but whatever team drafts him is going to have to hope that he was saving some of his effort for the NFL. Thanks for the honesty and good to hear. You probably watched him every game as Nole fan (who is not a homer ) so your opinion provides good insight. The “hates contact “ scares me for sure. Speed rushers who succeeded in the NFL need to be able to convert speed to power (the ability to abandon the speed rush and use power to finish the rush). Burns struggles mightily is this area. As Phil Sims recently said ‘Von Miller’s best move is his power rush’. If the Bucs determine he can be develop spped to power then draft him otherwise we’re getting Vic Beasley. Burns can play LB some as well which suggests he may be more Anthony Barr as his floor. No thanks…..I’m with Pickgrin…..we need to come away with MLB & OG in rounds 1 & 2……if we trade down…..then MLB, OG, DE…..
OK so we now have JPP, Nassib, Barrett, Gholston & Spence and Joe wants to add Spence-2. Fast but light & lacks power … gosh does that sound familiar. IF the Bucs devote any of our Top-3 picks to a DE, it can’t be in the 1st Round; too many other higher priority NEEDS. Focus Joe focus. Bucs NEED a MLB to make this 3-4/hybrid defense work (not to mention our dire need for LEADERSHIP on defense). And assuming that we let GMC walk (because we NEED that $13 mil to pay for our rookies AND buy 1-2 FAs to fill starting holes) then we’ll NEED another DT. LOTS of DEs that would be awesome-to-have, BUT we can survive with what we have at DE. We’ll get creamed though IF we don’t upgrade our MLB, DT & CB starters. That’d leave us vulnerable right up the middle, and that’s where we’ve gotten killed these past 2 years especially. Draft QUINNEN WILLIAMS (if he’s there) or DEVIN WHITE (if Q is already gone). Montez Sweat is bigger, faster, than any LB in this draft. Daddy always said not to trust any man who drives a Ford…. much less sells them. Seems undersized….You don’t see many D-linemen having success weighing under 250. I’d rather take the #1 or #2 ranked LB….O-linemen….CB…etc vs the 4th or 5th best d-end. Brian Burns will be an excellent edge rusher in the NFL. He was a lone wolf often times on the Florida State defense this past year. My biggest concern is his thin frame. Will he be able to put on good weight to hold up against the run? If not he will only be able to be a pass rushing specialist, but if he can put on 20 pounds of good weight then I do think he can be a dominant OLB/DE in the NFL. Why does Jason Licht like slow defensive backs? We have vaunted Rice to HOF status, but doesn’t anyone remember the incredible disappearing act he routinely pulled? He had so many games where he barely registered a stat. JPP, on the other hand, was the only bright spot of the defense last year. No Sapp, no Brooks, no Lynch, no Barber to help him. JPP is simply the best player on defense. This crap about trading him or whatever to save cap room is akin to burning down your house to reduce your bills. Don’t know about Burns but if FSU fans don’t love him, that is a valuable piece of information. Talking draft is like talking religion and politics. People always disagree. The difference here is some people choose to not only disagree, but to insult. As to Burns…I know next to nothing about this year’s crop of draftees. It’s intentional. I want to view our picks without any preconceived notions this year in an effort to be objective. And I really do not subscribe to the ‘don’t reach’ theory…except in extremes (I wouldn’t take a 7th rounder in the first round obviously). To me, if you feel a player is important to get, it doesn’t matter if he is projected to go ten pick later. You take him. After all, the people who rank the players are the same people who fail at mock drafts year after year. Their rankings are biased to fit their mocks. The truth is that every team has two sets of rankings. The first is the standard rankings distributed to every team. This is used to gauge value in negotiations. The second rankings are those developed by the individual teams. For example, the Bucs value particular players differently than the Packers. This is why mock drafts are almost never accurate. A team might see things differently than everyone else. Ali Marpet was a great example of this. At the time, fans felt he was a reach. Now? Not so much. That said, if there is a strong chance that Burns is there in the second or third round, best to wait. It would be a gamble because another team might take him…but taking him because of that is a decision based on fear and those never work out. I personally think the pick will be a defensive tackle. The fact that McCoy has not been restructured just sort of points to it. The Bucs don’t want to be locked into anything because they hope to draft a replacement. Trade Back 2-3 spots and get Jaylon Ferguson in the 2nd with the extra pick if he is still there. JPP clone. My prediction that it will be a tackle is not to state my preference. I’m just trying to read the tea leaves. Personally, I don’t care who they pick, so long as that person can help us win quickly. Although…if they take a kicker in round one, I’ll pretty much explode. Good player, not worthy of the fifth pick in the draft. Burns would not be a full time starter for us, he would be splitting reps with Carl, and JPP. Joe doesn’t think White is worth the 5th pick in the draft, but he would never come off the field. He’d play every snap as the Q.B. of our defense, something we don’t have but need, a leader. This team needs that alpha dog in the middle. Kwon was never that tone setter, he lead us to now where. McCoy the same. If White comes close to a Ray Lewis type MLB that’s what this team needs more then a part time edge rusher. Its Burns + 2nd + 4th vs the above. The comparisons to Rice are silly. If he was Rice 2.0 he’d be first pick in the draft. Prolly buncha of guys Rice’s size and 40 time. So what. Stay at 5 IMO. One great player can change a defense and 2nd round hasn’t been our friend. It is a mistake; in my opinion, if the Bucs do not take advantage of the strength of this draft and get a defensive linemen with their first round pick. Taking a thin frame and suddenly adding weight equates to blown knees left and right. Might be fast, but no strength will do him in at the NFL level. Whoever they pick, it better not be a swing and a miss. With Barrett, JPP, Nassib I feel like we can afford to look elsewhere, especially if Q, Bosa, and Allen are off the board. Not for nothing, but we started off this off-season desperately needing OL. I don’t see where that has changed. Secondly, we now have a hole at MLB. The #5 pick should be a no-brainer. Get the player you want. THAT player better be a deade-long starter, if not a Pro-Bowler. In other words, he looks like Tarzan, plays like Jane. Spence was not a 1st round pick, that disaster occurred in the 2nd round. I like dropping back to load up on draft picks, but the middle 1st round has many gems like Jonah Williams, Devin Bush or Dexter Lawrence (340 Lbs). I agree with your post to get Ed Oliver in the first, but Polite is not anywhere close to the pro prospect Burns is. Regardless, I doubt Burns is in the Bucs conversation unless they trade back with Washington or Denver. The position that is deepest In draft is Dline. We don’t have to reach at 5. We can stay at 5 and get what we want . A future pro bowler at 5 and immediate starter …rookie of the year. I’m ok with Olivier but white can come in as leader of the defense as a rookie. Listen to his combine interviews The dude has swag. Ray Lewis comparison – yes. Patrick Willis size and speed comparison could be. Watch his YouTube. I think he could average around 5 sacks a year. Also , he can stop these elusive running backs in our division. His upside is filthy as he has only played linebacker for 3 years. For the ‘Smart Guys’ out there: a 2nd MLB to pair with LVD in the middle of our new 3-4, a stud DT to replace McCoy, and a RG are our 3 biggest needs. And you don’t ignore your biggest needs with your 1st draft pick. The pick will be one of those 3 positions, most likely MLB or DT. Bird I see you and I are thinking the same. Draft is deep at D line get White at 5 and still get a quality Dlineman top of the 2nd. I’m not understanding why so many people are ok with passing on the best MLB in the draft which is a position of need to take the 4th or 5th best Dlineman who won’t be covering the likes of Kamara McCaffery or Freeman. We’ve got killed by those guys. White has played defense for 3years and look at what he’s done. Those talking about the way he tackles need to watch some Luke Kuechley film. And I’m a FSU fan and don’t think you pass on White for Burns. Like a few posters here, I really like the Burns kid. But not at #5 though. The worry is about his weight. Maybe he CAN put on enough weight to set the edge and hold up against NFL Offensive lineman…maybe not. That’s too much of an unknown for me in the top 10, much less at 5. If the Buccaneers are comfortable with him as a situational pass rusher early in his career then I’m cool with him on a trade back scenario. I also like that Polite kid from UF. But I think most of us that follow this process are puzzled by the young man’s poor combine performance and shaky interviews. He’s out of shape and ill prepared at one of the most important times in his life? I LOVE the kid’s tape but that’s a huge red flag for most teams. On the other hand many NFL FLOPS have KILLED IT at the combine. i think their in the same boat….burns may have slightly better upside due to his measurable but before the combine interviews polite was considered a top10 pick…..
i wouldnt be mad if burns slipped to the 2nd and we grabbed him…..then selected an OG in the 3rd…. oliver, burns, OG would be great…. I am a big Burns fan. Guy was always in the backfield and always applying pressure. He has Aldon Smith type upside IMO and good character. I’d approve if we moved back to 10-15 and took him in that range. Him / Sweat are on about equal footing for me, and Burns actually may be even more of a natural 3-4 OLB. JPP = more of a 3-4 DE/DT than a 3-4 OLB/DE. He will have his hand in the dirt still. Same with Gholston. Gholston will not be rushing as a 3-4 OLB. Nassib is a more natural 4-3 DE than 3-4 OLB but he should be OK there. Barret is the only prototypical size/speed 3-4 OLB on the team right now beyond Spence, and not sure we can count on Spence. A train.. a day two pick for burns? You’re either incredibly stupid or a gaytor fan, cant tell which. Burns will go top 15 and you can book it. FSU Grad here, watch every game every year. Brian Burns is the real deal. He was absolutely dominant in 80% of the games he played. This is all while he was the only guy on FSU’s front 4 that the other team really had to key on. Don’t forget how bad our D Coordinator has been-very Mike Smith-like. Now, having said that, F no you don’t take him at 5. I wouldn’t take him at 10 either. Now if we do a double trade down I would be okay with him at 15+ but only with a crap full of extra picks. White/Allen/Oliver/Williams if we stay. Still think Jonah Williams or Taylor from UF is what we need and move D Smith to RT or G is the play, but I am resigned to the fact I am in the minority here. When I was 18, playing 7 on 7 pickup football (with some players from our high school team), I made the most amazing catch that most everywhere there said was one of the best they had ever seen. I laid out as far as I possibly could, keep in mind no sissy gloves, no sissy pads, and fully extended caught a ball with my finger tips. What made the catch so good as this little midget kid, who was maybe like 5′ 4″ and 140lbs, was running full speed and as I was fully extended, he nailed me right in my ribs, so not only did I make a finger tip catch, I got helicopter spun while in the air but had the awareness to pull the ball in, then as I hit the ground, with my hands firmly under the ball, I landed, with nothing to break the fall really, directly on the ball which proceeded to knock the wind out of him and I rolled around on the ground for like 5 mins doing that whole deal you do when the wind is knocked out of you – then once I could breath again I realized it hurt to breath since I’m pretty sure I broke/cracked/bruised my ribs from the midget hitting me square in the ribs. Anywho, point being, my fantastic catch, witnessed by nearly a dozen people, didn’t mean I was any good. Making an OK catch on the sideline with no one around doesn’t really mean you’re the next Simeon Rice. Just so people have an idea…A good comp for B.Burns today is a better version of UK’s Josh Allen – His JR yr – 2017. If Josh Allen falls to #5 – no way Bucs pass on him… But if Allen isn’t there & a QB needy team comes calling…(DEN @ 10 / MIA @ 13)…Burns is an ideal 2nd option to target for Bowles’ 3-4 OLB /Edge chess piece. Put the UF-FSU game tape on watch this stiff get owned. Somebody said “edge rusher”, and Joe said “you’re hired”. Gaines Adam’s was 6’5″ 258 lbs. and ran a 4.6 forty….. They sold us on that Simeon Rice comparison too.